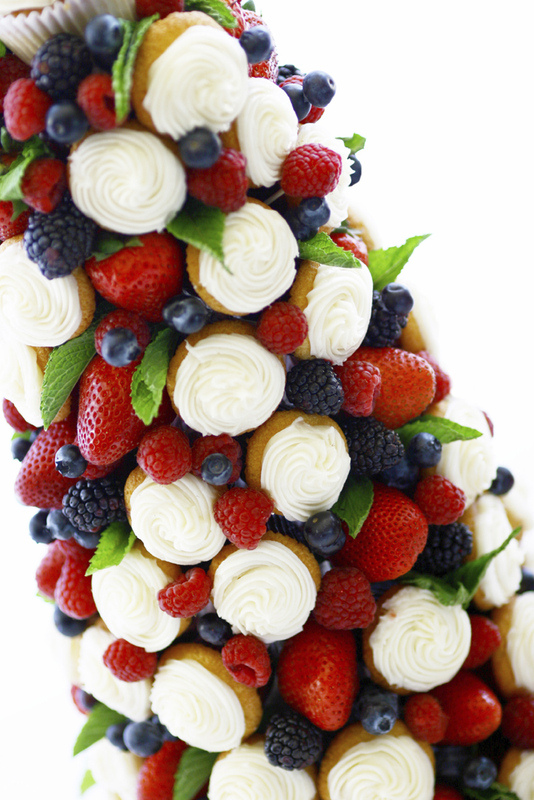 Perfect for a Memorial Day or 4th of July get together, this cupcake tower is sure to WOW any crowd. You will need 1 large styrofoam cone (at a local craft store) and around 24 3-6″ wooden dowels, plus toothpicks for the fruit. Cupcakes can be baked and frosted as usual, however a more dense cupcake will work better for attaching to the tower. Try using a pound cake, chocolate cake or carrot cake for best results. Frost with buttercream or cream cheese frosting using a star tip. Now affix each strawberry, blueberry or other piece of fruit to a toothpick and push toothpick into styrofoam, in between each cupcakes. You can make fruit kabobs as well and place a few pieces of fruit onto each toothpick.Make sure to completely fill up styrofoam tower so there is no syrofoam showing. Add sprigs of fresh mint to complete the look. This entry was posted in Cupcake Recipes & Ideas, Instructions & How-To's by Fancy Flours. Bookmark the permalink. This is elegant. Do you have any other photos or angles of this? I would like to see more of the tower and how you displayed it.